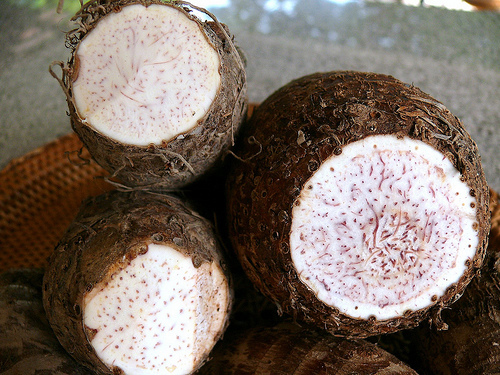 I once went to a Chinese restaurant with a Chinese friend, and there was this sort of yam which was white colored and covered with a whole bunch of red/pink dots resembling freckles and these dots would be found inside of it whenever cut. This food was then boiled in a pot of water and other stuff on the table and once soft it could be eaten just like a yam or potato and was very delicious. My friend said in Chinese it's called wooden potato or wooden potato (something like "mu shu", perhaps 木薯). However, I wasn't able to find this anywhere on the Internet (or, at least, I was not able to find the one with all the red/pink freckles). Anyone know what this kind is properly called (in Chinese and in English), where to find more information about it, and where to buy it? 木薯 (pronounced mù shǔ, literally translated as wood tuber) seems to be nothing other than cassava / maniok / tapioca. Did it look like this? 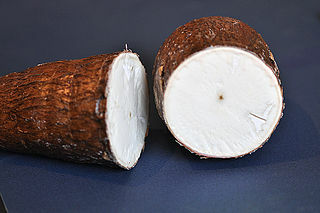 Often only the products made by cassava starch or the starch itself is called tapioca. In Germany you can find cassava in asian grocery stores but in large "normal" grocery stores, too. I guess this also applies to any other location. Not the answer you're looking for? Browse other questions tagged potatoes tomatoes language chinese-cuisine root or ask your own question. What is Zwieback toast and where can I find it?